Cortines decision on bond money for iPads: a policy u-turn? A decision by LA Unified Superintendent Ramon Cortines to proceed with the next phase of the district’s controversial iPad program appears to contradict statements he made a month ago, opposing the use of construction bond money to pay for devices pre-loaded with curriculum. Three days ago, Cortines gave the go-ahead to spend capital improvement funds to outfit another 27 schools with tablet devices and 21 campuses with laptops. 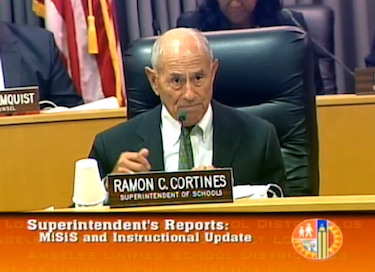 Tom Waldman, a spokesman for the school board, said Cortines is not in the office this week and would be unavailable to clarify any apparent discrepancy. In January, months before Cortines replaced former Superintendent John Deasy, the school board unanimously approved $114 million to expand the program. But ever since Cortines took the reins last month he has come out swinging against idea of using bond dollars for the Pearson software that the board approved for the iPads bought from Apple. Under the new round of purchases — officially called phase 2B – principals at each school will have “more options” and won’t have to settle for iPads if they prefer an alternative, according to the district. But so far, the district has not opened the bidding process to any new vendors or curriculum developers. Although the full timeline for implementation of the latest phase has yet to be determined, Cortines says students will have the new devices by February.